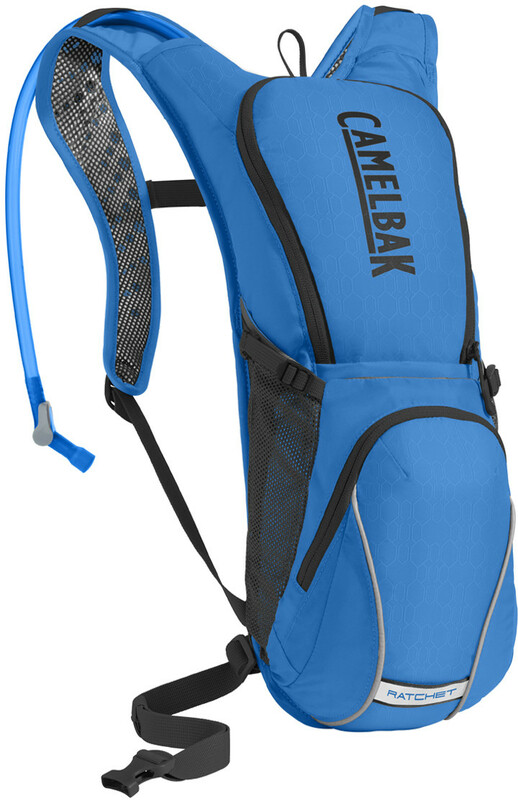 CamelBak: Your ideal companion for hot, sweaty rides, the Ratchet is the lightest CamelBak bike pack with the most hydration capacity—its 3L Crux reservoir will fuel rides of 3+ hours. With a small zippered pocket for essentials and a stretchy overflow compartment for layers, this pack gives you an efficient way of hauling the bare necessities for a long ride, whether you’re on pavement, trail, or gravel. PACK ONLY WEIGHT: 300g / 0 lb 10 oz TORSO FIT RANGE: 43-53cm / 17-21 in WAIST FIT RANGE: 66-116cm / 26-46 in FABRIC: 200D Polyester Plain Weave FEATURES: • The brand new Crux delivers 20% more water per sip, with an ergonomic handle for easier refilling, and an on/off lever that makes it easy to prevent leaks. • Breathable air mesh back panel for a lightweight, comfortable fit. • Integrated tool organization keeps your tools organized. • Ventilated harness for comfort and breathability. • Stretch overflow storage compartment lets you easily stash a rain shell or extra layer. • Reflective accents for visibility in low-light environments. • Removable stability belt helps to keep pack secure over technical terrain.